You don't need to get rid of your pet(s). Call us for your IAQ (Indoor Air Quality) options. for your Entire Indoor Environment. By its very nature, a new home is susceptible to factors that may result in poor indoor air quality. Off-gassing from new carpets, sealing agents, chemicals and other elements are part of the problem. Also, overtime, dust, pet dander, mold spores, and other allergens can build up. Poor indoor air quality has been flamed for the rise in asthma cases - those who suffer from allergies are especially at risk. A "HEPA Healthy Home" is the best way available to combat these problems. Click on the picture below to go to site for more information. The Venmar Air to Air Hepa Filtration System is much more than just a heat recovery ventilator. Their system pre heats the outdoor air prior to circulation it and features whole-house Hepa filtration combined with a fresh air supply. 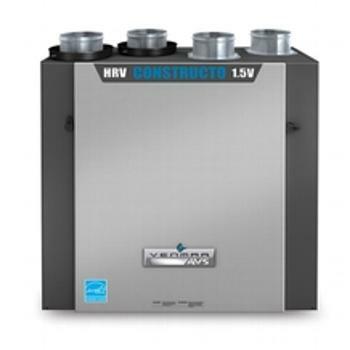 Experts agree, fresh air Heat Recovery combined with Hepa filtration will ensure the greatest indoor air quality and comfort in residential spaces.